As I’ve looked over this I’ve had an eye on how it is possible to deliver Space For Cycling, in keeping with the Mayor’s Vision For Cycling and LCC’s own commitments to Go Dutch as signed up to by Boris Johnson in his campaigning for the second term as mayor where he agreed that future major developments are a priority to deliver good segregated infrastructure. There isn’t much commitment in the framework as it stands. It is enormous document and not particularly easy to digest, so I’ve reviewed the details and here are the edited highlights of issues relevant to cycling. The economic health of the historic Shepherds Bush Town Centre will be revived. It will be a thriving destination in its own right, with an invigorated market, theatre, refurbished common and focus on The Opportunity Area will be fully integrated within the wider local area. The area will be a model of high quality urban design, sustainable architecture and construction situated within a first class, permeable and inclusive public realm to encourage walking and cycling. Many people will choose to both live and work in the area, reducing the need for commuting and demand on the public transport and road network. The majority of new trips in and out of the area will be made by public transport, walking and cycling, to avoid adding to road congestion. Fine words, naturally, but a good overview of the idea. Bear in mind that Cycle Crossrail is also set to land in the White City Opportunity Area heading West along the Westway (segregated!) towards Hyde Park and central London and East alongside the A40 corridor to an as yet unknown destination likely somewhere beyond Ealing. An important aspect to be aware of is that there will be some green space in the new area north of Westfield. This will be designed for use by those on foot, on bikes and (perhaps surprisingly) on horses to access nearby stables. The framework has highlighted Hyde Park as an example of this working well. However, Hyde Park’s present paths were built to be used as pedestrian facilities alongside sandy tracks for horses, with cyclists added later with a particularly narrow (1m wide) path delineated by a white line. This is far below good standards in the UK let alone being Dutch. If there are to be parallel paths for walking, cycling and equestrian use, it would be better for them to be planned to have some form of segregation or much wider width than the Hyde Park illustration they have used. There are set to be new roads delivered north of Westfield. The most interesting of these is White City Lane, which is intended to be usable by all road users but with a priority cycle route. 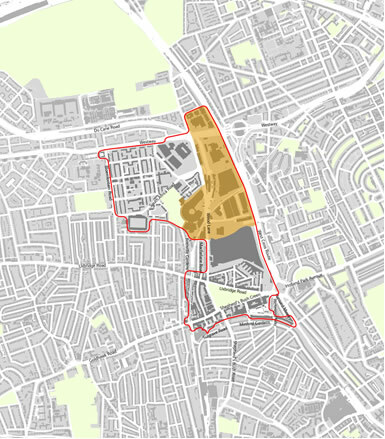 This would run from Wood Lane north of the Westway through the new Imperial College site, under the Westway and through the middle of the site north of Westfield, before rejoining Wood Lane close to the entrance to TV Centre. Cyclists, however would be able to cycle over the new green (roughly similar to Brook Green in style) and further south either side of Westfield or over either a new bridge over the West Cross Route or on a (hopefully better) alignment (a large ramp over existing roads) towards the existing cycle bridge over the West Cross Route which uses lifts and a very tight series of zig-zags. There is a lot of concern in the framework about the increased demand for car trips both seen as inevitable in future and due to growth due to this development and the existing Westfield development. This means they are proposing interventions around Shepherd’s Bush Green which they are terming “junction improvements”, this is counter to the flow of the ideas in Chapter 3 where new bridges, new routes and changed approaches to street design are planned to provide unspecified but seemingly better cycle provision. Provision of safe, secure and accessible cycle parking at all new developments, both for occupants and for visitors, including end of journey facilities. There is very little detail on quality, sadly, or what any of this might look like. They are broadly good words. Though I would prefer we were specifycing ‘safe cycling throughout the area’ rather than ‘safe cycle priority at junctions’. It is worth at this point heading into Appendix B and flicking to page 95. Here there are “indicative junction improvements”. Now, they are not final, and they are very sketchy. However, no harm in responding clearly to these at this stage. And here’s the first ‘indicative’ junction improvement. This increases the lanes on the West side of Shepherds Bush Green from 4 to 5. This would also replace the single lane north into Wood Lane with two traffic lanes and remove a cycle lane. From Wood Lane heading South this would remove the cycle lanes both on the left and the right. Note that this would remove access to Wood Lane from Shepherds Bush Green by bike. Note also that there is not even an advance stop line for cyclists heading north into Wood Lane from Shepherd’s Bush Green. Note that this is the original junction design from when the cycle paths were implemented in the late 1980s, there are no longer two-way dedicated paths on Shepherds Bush Green and instead there are parallel paths all around the green and considerate cycling is permitted throughout. What that means is that there is an existing cycle contraflow around the edge of Shepherds Bush Green, and thus the key link to reach from Wood Lane is commonly the north/south link towards Hammersmith Road and Goldhawk Road. The new plan would make access this mean taking the right hand lane exiting Wood Lane coming south, and in so doing negotiating with traffic. There is no feeder lane for the advance stop line so cyclists would either wait an additional phase or overtake into oncoming traffic. This is a step backwards. I am not convinced that two lanes for general traffic here are compatible with either cycling having good access to the Green or the volume of buses which use this route. For the junction of Goldhawk Road and the Green we see an extra lane going around the gyratory. This reduces the size of the island here, which as you’ll see from the image of the scheme as delivered in the 1980s may reduce space for cycling. This is a particularly complex junction. Both this and the previous junction adaptations really only cater to north/south cycling through Shepherds Bush Green. The primary flows currently are east/west. With cycle crossrail landing near Wood Lane and the new developments perhaps flows will shift with more traffic heading north towards these developments making these links more important. I would like to see good cycle facilities to navigate this gyratory in all directions. It was good that we had some segregated infrastructure delivered in the 80s, but we are now essentially three decades later and should be developing what provision there is. As a moment of added fun, TfL also suggest having the bus station at the southern interchange of Westfield run in reverse. This could well remove cyclists from using the bus lane to enter Westfield, leaving them with a bike lane that usually has a van and plenty of pedestrians parked in it (it’s on the pavement and poorly marked). I have queried these indicative improvements with the council as part of the local LCC group and been given the following response by an LBHF Officer (Matthew Veale) – “Provision for cyclists will be a high priority in the further design of these highway interventions and Hammersmith and Fulham Cyclists will be consulted on the detailed proposals.” There will be further consultation. I think it is up to us to think about how best to retain and enhance space for cycling here with a mind to making the road space around Shepherds Bush Green less of a barrier and more of a link. It is of note that gyratories of similar style are proposed to be removed throughout London such as Aldgate and Elephant and Castle and it appears Hammersmith Broadway could be revamped as part of the Flyunder proposal to replace the Hammersmith Flyover. In that context, fiddling with the edges of Shepherd’s Bush Green to increase the number of general traffic lanes appears rather old, and on that note bear in mind the TfL study is already a year old and predates the Mayor’s Cycling Vision and the Roads Task Force report. A commitment to high quality cycle infrastructure with streets where cyclists are to be prioritised delivered along lines similar to those seen in the Netherlands. Safety needs to be built in early and be there subjectively. I don’t want models to tell me the junctions are safe, I want cycling to look appealing and enticing so that you’d almost feel a fool not to be doing it. Careful planning for the sections where people on foot, cycle and horse are expected to mix. In particular this appears to be an issue for the north/south green route at the right of the site. A rethink of the plans to increase capacity around Shepherds Bush Green, it seems unlikely these will reduce congestion in the longer term and it could involve removing cycle facilities. A plan to replace the gyratory and discourage certain shorter journeys may be of more benefit. The TfL modelling admits whatever happens the roads will be saturated by demand even with the slated improvements. Any better ideas are welcome in the comments, closing date is tomorrow 2nd August, but I understand from the London Tenants Federation that some comments may be accepted up to the 9th.